You'll be magnifying everything around you! "When this item arrived at ThinkGeek headquarters we found it to be very fun and, quite honestly, pretty addictive. With the ability to zoom in on objects with various levels of magnification, it's amazing how many ordinary items suddenly become much more intriguing when enlarged. Getting a closer look often can illuminate many new details and a whole new level of understanding about the composition of an object. Magnification can reveal both flaws and unexpected complexities". The Portable Digital Magnifier outputs the magnification to a crystal clear 2" LCD screen and with the push of a button the image can be frozen on the screen, for closer inspection. A conveniently located scroll wheel lets you instantly change the magnification level, from 5x to 20x (in increments of 1x). 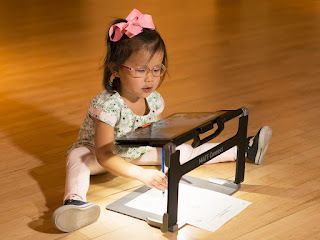 The magnifier illuminates using three built-in LEDs and the included batteries re-charge via USB connection. Takes 3 rechargeable AAA batteries. Dimensions: 4.75" x 2.4" x .85" and weighs 4oz. There's no mention of how helpful this could be to someone who has low vision, but it sounds really cool! Its even cooler when you find that the price is under $200 and the only drawback that I see is the screen, it may be a little small at 2". Click this link to purchase the Portable Digital Magnifier from ThinkGeek.